Scout is just a little over 4 months, and she’s interested in food. Specifically, my food. Even more specifically, my birthday food. 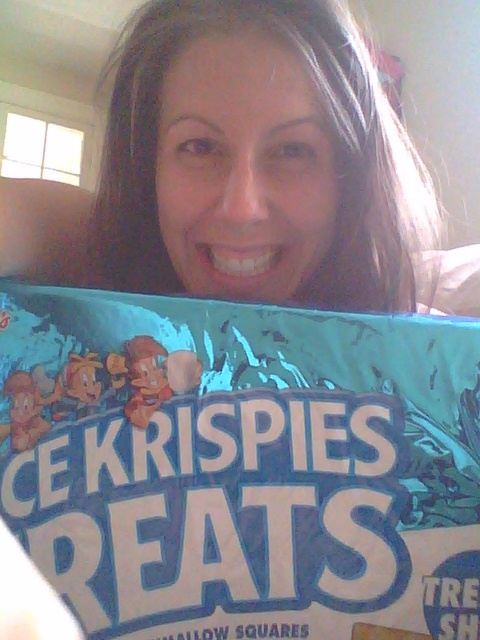 A friend sent me a giant Rice Krispie Treat. It’s the length of my arm. I’m sorry I can’t hold the phone out far enough to show you the full magnitude. Scout overheard the doctor saying she can start eating rice cereal, and she took the initiative to begin with my Rice Krispie Treat. 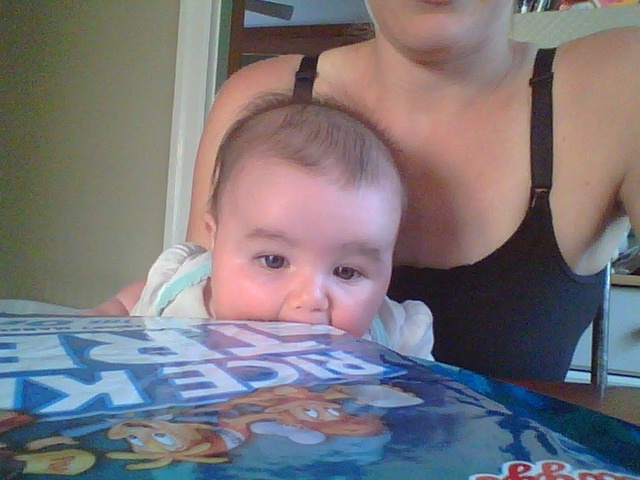 She is still working on hand-and-eye coordination. And she doesn’t know what a wrapper is. 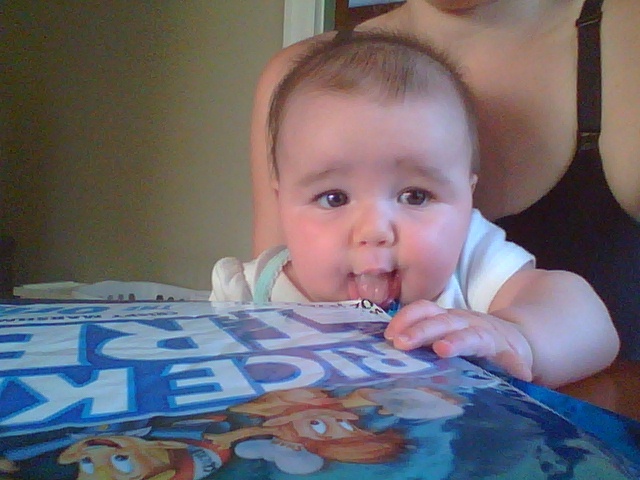 May I present how Scout eats Rice Krispie Treats. Step 1: Use Your Tongue. Kiefer and I take responsibility for this. I may have given her a lick of my strawberry popsicle. She liked it. Then Kiefer may have given her a lick of his lime popsicle. She may have definitely not liked it. 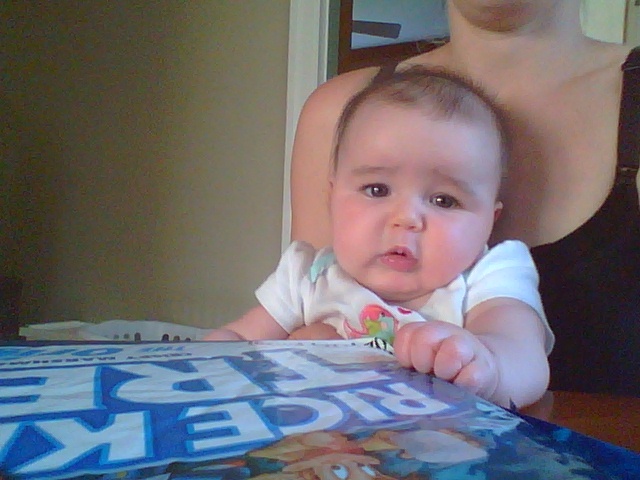 Hopefully, someone will take pity on you despite the fact that you’re a baby and have no teeth. *Scout had her first Pop-Tart rice cereal on Sunday. She was so excited she knocked the bowl out of my hands and all over her. Mommy Fail. It’s fall. You know what that means? It’s overstuff-yourself-with-yummy-dessert season. * This season begins on Halloween and runs until the last Christmas cookie is dipped in hot chocolate and devoured. *Pumpkin pie is not included in this season in our house. In fact, even uttering the word “pumpkin” will get you a mouth full of soap. Up until this point, I’ve tolerated your fruity cravings and indulged you with popsicles instead of ice cream. But now…now we need to talk. While I appreciate that you’re no longer squishing my bladder, I’m asking you to occasionally stop squishing my stomach. If that means returning to bladder bouncing, so be it. The other day work was selling warm, homemade apple dumplings. Warm. Homemade. As if that wasn’t enough, a scoop of vanilla ice cream graced the top and meltily trickled down the sides. And I couldn’t finish it. Lucky for you, no one saw the leftover goodness in my trashcan. Thanksgiving is just over a week away. Step up your game. We have a reputation to uphold. Kiefer and I always take a “cut” of Boo’s and Radley’s candy on Halloween night. Because I feel guilty, my cut is about 5 pieces from each boy, and it’s dark chocolate or candy that they don’t like. For Boo, that meant Almond Joys, and for Radley, that meant Milky Way Darks. I love both. Kiefer, on the other hand, takes a greater percentage. And over the next couple weeks, he also gradually sneaks a handful or two to take to work. The boys ended up with at least 3 times this much candy. Upon inspection of all their candy, we found about 6 full-size candy bars in each bag. What the…. I NEVER got a full-size candy bar in all my years of trick-r-treating. This Halloween I met one kid who deserved a full-size candy bar…and it wasn’t because he had an amazing costume. Our neighbors set up a Yard Haunt. It’s a miniwalk through their yard to the front door. Scary guys in costume jump out at you. We hear a lot of screaming, and we enjoy it because we’re awful people who take pleasure in the screams of others. Kiefer: I’ll give you extra candy if you go next door. Kid: I’m not doing that! It’s too scary! Last year, I pooped my pants! 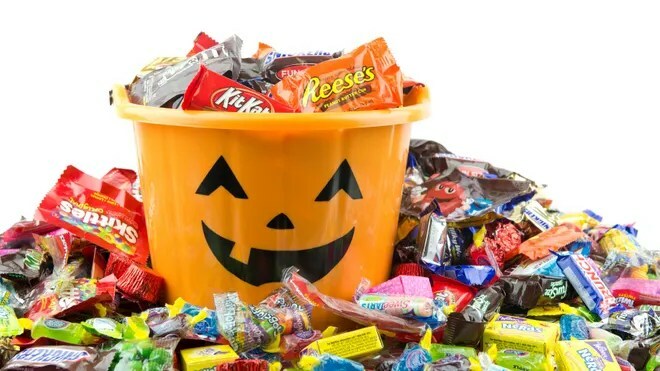 That kid, and only that kid, deserved a full-size candy bar on Halloween. Tuesday and Wednesday work was hot. And when I got home after work…my apartment’s AC was broken. Of course. Welcome to my life. The heat sent me into an extreme sloth-like state. Because it was too hot to make my own decisions, I decided to put the responsibility on someone else. 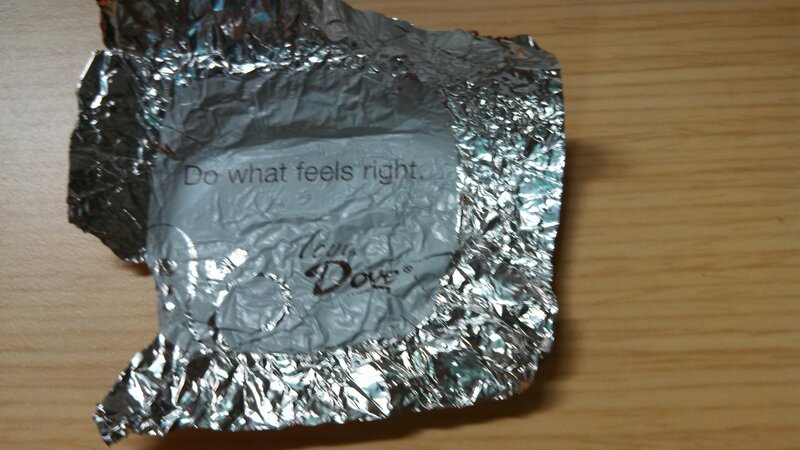 Remember when the Dove chocolate gave me a sign? Well…I’ve decided to let chocolate dictate my life. That’s right: a dessert dictator. It was that or the Magic 8 Ball. 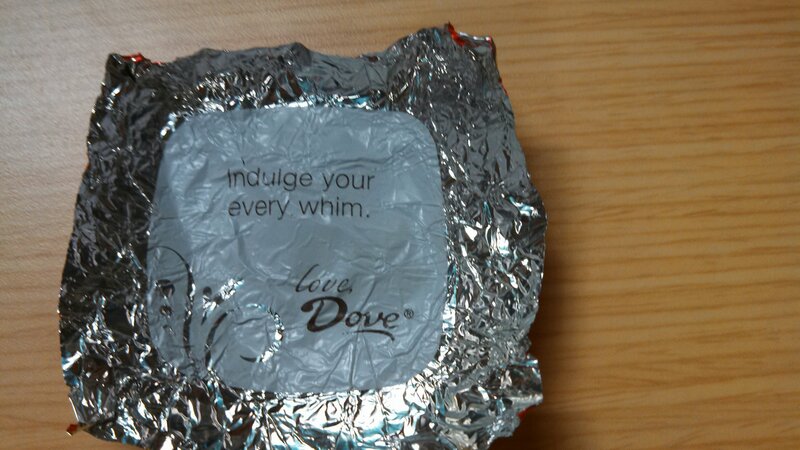 I’m saving all the wrappers from my Dove chocolate, and I’m doing what the chocolate tells me to do. Do what feels right. Obviously, it felt right to eat the lower left corner of the wrapper. What feels right is…to have another piece of chocolate. This confirmed that the second piece was ok. I think I’m going to like this challenge. Have a great weekend! I’ll be in Pittsburgh, so let me know what to check out while I’m there. Math is not one of my strengths. It used to be. I rocked math until 11th grade. That’s when I took Pre-Calc and Trig, earned my first C, and it was all downhill from there. I swore off math forever. Well…until I was required to take a math class in college. Then Math and I came to agreement. Math agreed to leave me alone as long as I retained the basic skills needed to balance my checkbook or convert measurements for baking. After that, we shook hands and went our separate ways. Until now. Tomorrow is 3-14: Pi Day. When the Accidental Stepmom announced her Pi Day Pie Challenge, I decided to let a small slice of math back into my life. 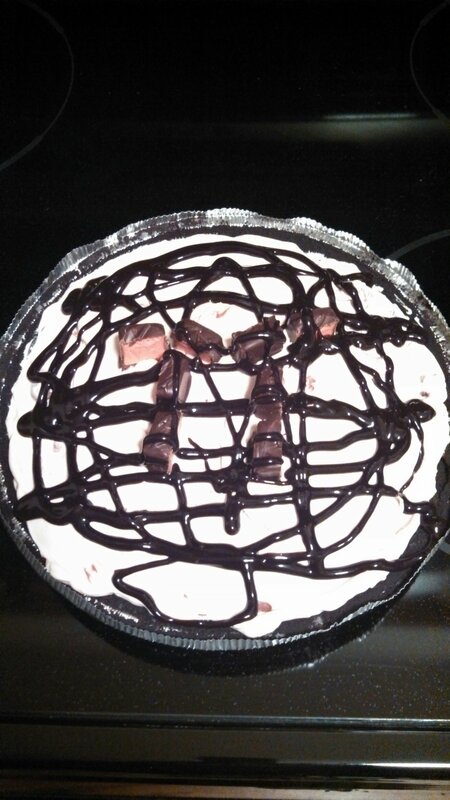 May I present to you…my Pi Day Pie. The recipe came from NanaBread. But the center decoration of Cherry 3 Musketeers was all my idea. I hope I didn’t go overboard on the syrup. I may have added even more chocolate syrup after this picture was taken. There’s till time to submit your own pie! You have until midnight tonight!